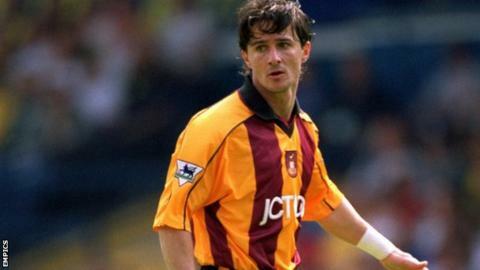 Former Bradford City forward Benito Carbone says the Bantams will need to show "big heart" to beat Swansea in the League Cup final on Sunday. The 41-year-old Italian played for the club during their two-year spell in the Premier League. City have beaten top tier sides Wigan,Arsenal and Aston Villa to progress to their first cup final since 1911. "They have to play like they did in the other games, with big heart," Carbone told BBC Radio Leeds. Then chairman Geoffrey Richmond later said the signing came during "six weeks of madness"
"They have to do more than the other team in every part of the pitch and keep maximum concentration. "I saw the games against Aston Villa and they played much better than them. They have nothing to lose now. "I think Bradford can win, why not? It is the game of their lives." Carbone joined the Bantams in August 2000 after a stint with Villa and scored 10 goals in 42 league appearances, before leaving for Italian side Como in July 2002. Despite not being able to help the club retain their Premier League status in the 2000-01 season and his £40,000 a week wages pushing the club to the brink of bankruptcy, the former Sheffield Wednesday player has fond memories of his time at Valley Parade. "We had a very unlucky season because we did everything we could but we couldn't stay up," he added. "I always remember very good things about the fans because they loved me and I tried to do my best for them every game. "I can imagine what the atmosphere will be like because when I was there the fans would go crazy for big games." Now managing Saint Christophe Valle D'Aosta in the Italian fourth tier, Carbone says he would love to coach in England. "I hope to come back to England because coming there was the best thing that happened in my career," he concluded. "I think I could do well there. It is my dream to come back there. "Maybe it would be nice for me to start my career there with Bradford City, I will wait and see."